Why did we decide to open on Sunday’s? 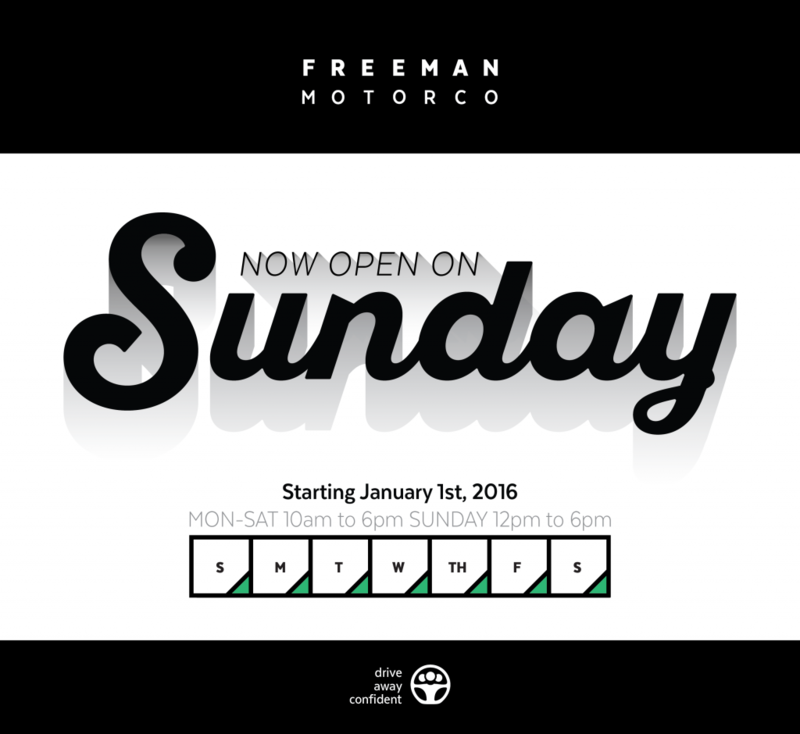 Freeman Motor Company thought being open on Sunday’s would be beneficial to change our hours of operation to accommodate both employees and customers. As of January, we were glad to announce that our showroom is open on Sundays from 12-6 P.M.
Our employees get two days off, but in sales, those two days off are typically split. Opening on Sundays helps us broaden the scheduling opportunities and allows each one of our employees to get two days-off in a row. We understand it’s important to disconnect and properly decompress from work and enjoy life at home. We also adjusted our hours on Sunday’s to be considerate of those attending church or other morning commitments. Car shopping can be timely, research heavy and stressful. Here at Freeman, we acknowledge these anxieties and are here to help make the process smooth, quick and painless. Browse our inventory online (www.freemanmotor.com), call to speak with one of our sales people and let us set-up a viewing that will get you in and out at your convenience. It is our confidence in our employees, products, cars and customer service that leaves YOU driving away confident.